Found near the marina on the southerly end of the Aberystwyth promanade at the mouth of the rivers Ystwyth and Rheidol. It is only five minutes walk from the town centre / train station. Vehicle access on the promonade only - not actually through the marina. English (Translate this text in English): Found near the marina on the southerly end of the Aberystwyth promanade at the mouth of the rivers Ystwyth and Rheidol. It is only five minutes walk from the town centre / train station. Vehicle access on the promonade only - not actually through the marina. English (Translate this text in English): Found near the marina on the southerly end of the Aberystwyth promanade at the mouth of the rivers Ystwyth and Rheidol. It is only five minutes walk from the town centre &#47; train station. Vehicle access on the promonade only - not actually through the marina. English (Translate this text in English): Found near the marina on the southerly end of the Aberystwyth promanade at the mouth of the rivers Ystwyth and Rheidol. It is only five minutes walk from the town centre &amp;#47; train station. Vehicle access on the promonade only - not actually through the marina. Pick a day when the numbers in the water are down, becouse it can get crowded. At high tide be aware of the rebounded waves from the harbour wall that can leave you airborne. After heavy rain the rivers spill out right next to the break and can take the less experienced unawares, allthough you can use this to get out back more easily. If its very crowded try one of the other two town breaks or Borth beach break which is only slightly further north for some more chilled surfing. English (Translate this text in English): Pick a day when the numbers in the water are down, becouse it can get crowded. At high tide be aware of the rebounded waves from the harbour wall that can leave you airborne. After heavy rain the rivers spill out right next to the break and can take the less experienced unawares, allthough you can use this to get out back more easily. If its very crowded try one of the other two town breaks or Borth beach break which is only slightly further north for some more chilled surfing. 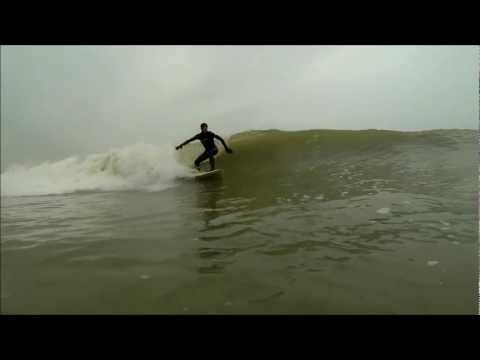 Mid wales offers some great surfing, allthough it can be a little inconsistant. The trap is one of the better and most easily accessable waves found in Mid Wales, and its more relaxed than many down south. Locals are generally friendly, enthusiastic and tollerant. English (Translate this text in English): Mid wales offers some great surfing, allthough it can be a little inconsistant. The trap is one of the better and most easily accessable waves found in Mid Wales, and its more relaxed than many down south. Locals are generally friendly, enthusiastic and tollerant. Great spot for slightly more experienced surfers given the right conditions. English (Translate this text in English): Great spot for slightly more experienced surfers given the right conditions. The Trap - I went to Uni in Aber from 94-97 and know the Trap fairly well. Aber is flat a lot of the time but on the few occasions when you get a big swell pushing up from the south west it really fires - I sponge but have seen a stand up surf the trap when double overheard, no joke. It gets very crowded though. There are other options - Bath Rocks on North Beach is fun and you can always try the wall - just by the Old College - short ride very dangerous as if you don't get off you'll go straight into the wall! Borth or Barmouth can be ok and there are a number of secret spots further down the coast.